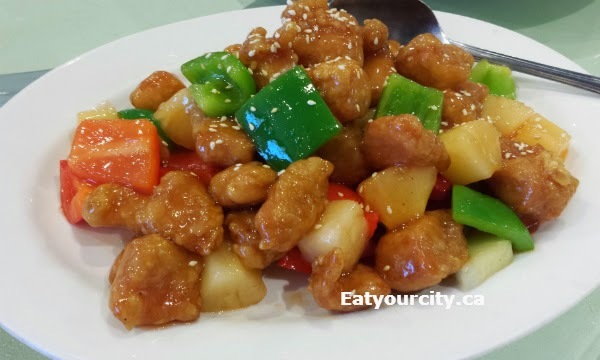 Eat Your City: Golden Paramount Seafood Restaurant Richmond, BC - tasty traditional Chinese dinner! 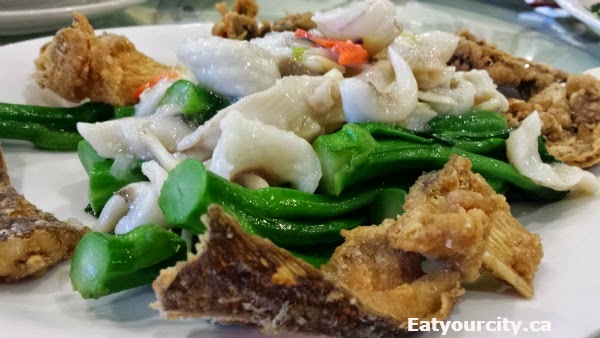 Golden Paramount Seafood Restaurant Richmond, BC - tasty traditional Chinese dinner! The decor is what you'd normally expect at a Chinese restaurant, though the service is friendly! 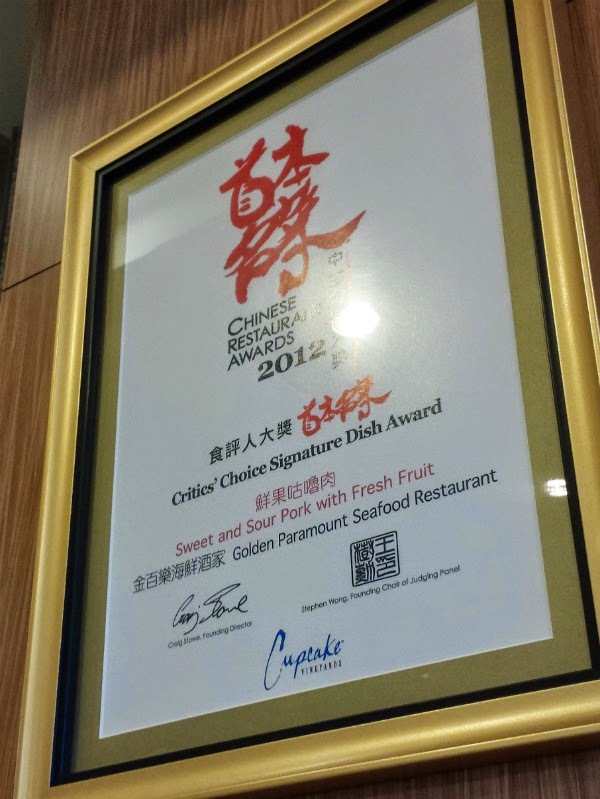 Rather than go with a set meal for our group, we picked items off the menu that had either won an award before (just have to look on their award filled walls to see what item an award was for).. and whatever we felt like eating. We started with the Pan Fried Oysters with Soya Sauce. 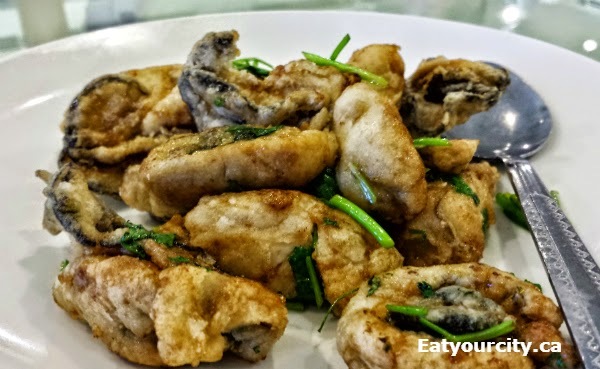 The fresh oysters are apparently air-dried to concentrate their tasty brininess and then pan-fried with sweet soy sauce resulting in a nice balance of salty-savory and sweet umani. The Fried milk and tofu was one of the stand out dishes of the night. 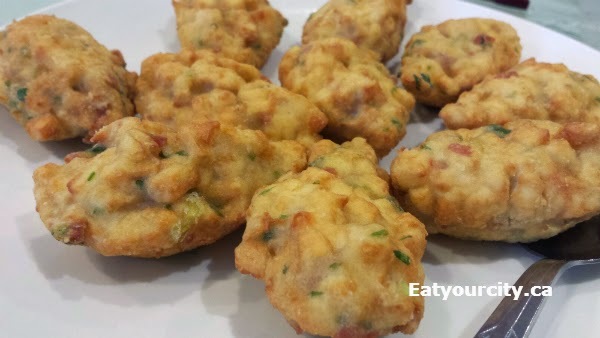 Quenelles (oval shape) formed from a mixture of milk, egg whites, lump crabmeat and green onions are deep fried to perfection. The Chef's special duck or Eight treasure duck requires advance notice (at least 24hrs) so they can prep the lovely stuffed and braised duck. A whole boneless duck is stuffed with glutinous sticky rice, barley, lotus seeds, chinese mushrooms, chestnuts, salted duck egg yolk, Chinese sausage and more! Okay, that's way more than 8 "treasures", but you get the point. The waiter started cutting into the duck before I had a chance to snap some pics. The duck was fall off the bone tender (well, it was boneless except for the drumsticks - you you get what I mean), flavorful and moist. 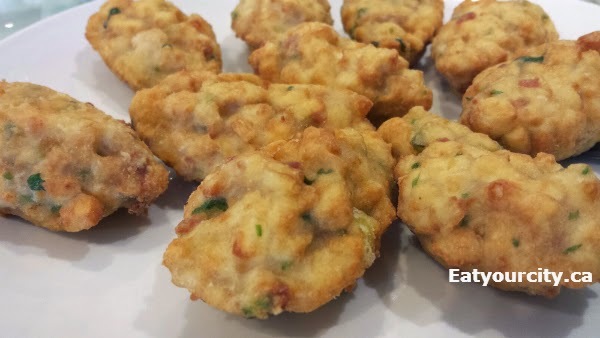 The stuffing was infused with the flavor of roasted duck, earthy mushrooms, savory chestnuts, salty flavorful salted duck egg yolks and salty savory Chinese sausage. Its like turkey stuffing made with sticky rice on steriods. Nom! The Sweet and sour pork with fruit was one of the award winning dishes - we enjoyed the simple but well executed dish. 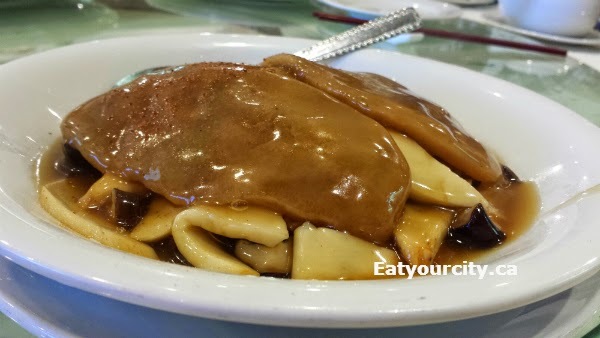 The boneless pork was about half fat, half lean meat that was dipped in batter, deep fried before being glazed with a light sweet and sour sauce that the batter absorbed becoming a soft sponge. Would have preferred the meat being more on the lean side, but it was tasty none the less. 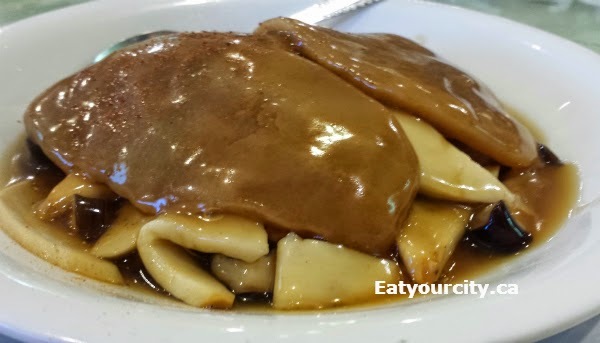 The Braised pomelo peel with mushroom and shrimp roe is one of my fiancee's grandfather's favs. A labor intensive dish that requires a pomelos' peel (looks like a gigantic grapefruit) to be soaked and rinsed over several days to remove all the bitterness from the white soft fibrous pith. 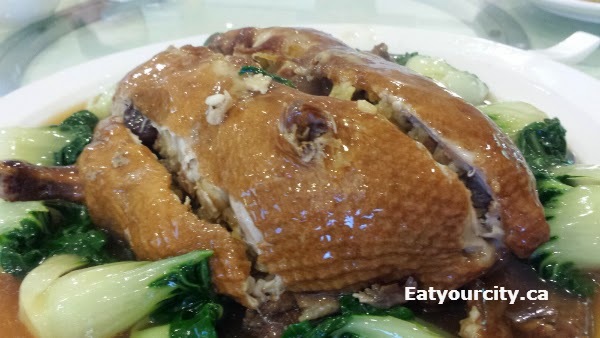 Its then braised for hours in an rich abalone or oyster sauce until its fork tender. The 2 slices of pomelo pith are saturated with savory earthy oyster and Chinese mushroom flavors. I didn't see any shrimp roe, but it was a very tasty and unique traditional dish. 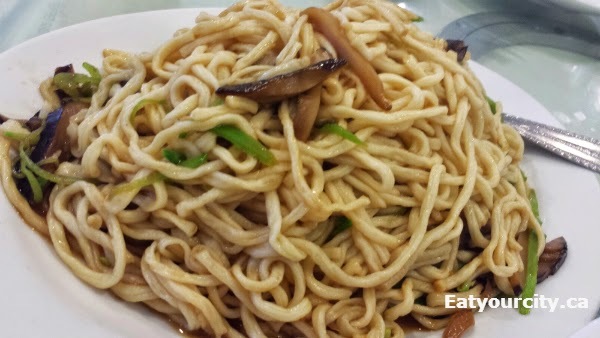 The Stir fried E-Fu noodle with mushroom could have used a bit more oyster sauce, but was aromatic with Chinese mushrooms, green onions and sesame oil. 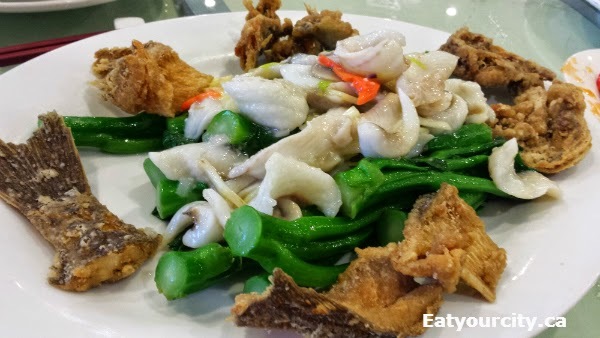 The Sautéed fish with gai lan was a nice simple dish of stir fried gai lan (tastes like a cross between broccolini and Swiss chard) in garlic and ginger, topped with a smattering of sautéed fish fillet. The remainder of the fish was super deep fried as an edible garnish - most of the bones were so crispy, you could nibble on them like chips! 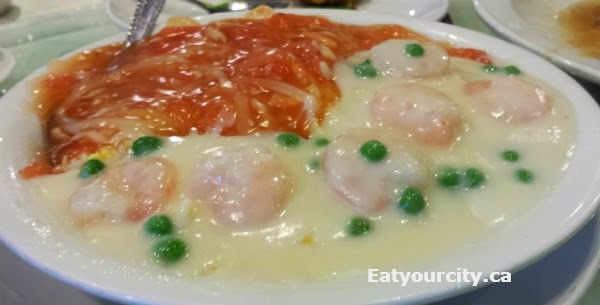 The Ying Yang rice where a generous amount of seasoned fried rice was topped with a creamy béchamel sauce with shrimp and peas, along with a slightly sweetened tomato sauce loaded up with slivered onions. Its a tasty, comforting and messy dish all in one. 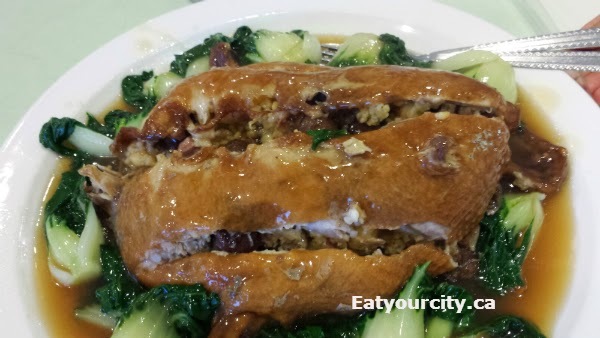 Would have loved to see better presentation, but it's still a great little place to go to try some tasty traditional Chinese food dishes.. just make sure you call to order the stuffed duck well in advance if you want to try! Will have to return sometime to try out their dim sum, which is what they're actually known for. Hours Open Wed-Monday 10:30 am – 3:00 pm, 5:00 – 10:00 pm, Closed Tuesdays.